Contrary to popular belief, Walt Disney’s body is not cryogenically frozen. That’s just a bourbon legend. He was cremated and his ashes were taken to Burbank where they were broadcasted by NBC through its affiliates. We didn’t have Mr. Rogers, Sesame Street and John Hughes movies when I grew up. I was raised on and by Walt Disney, everybody’s uncle, whose theme song began, “The world is a carousel of color …” I became so oversaturated and drunk with Walt Disney, that all his mastery, afterbirth and all, occupies an oversized dumpster in the back of my brain. “… History, comedy, fantasy,” the song continues. 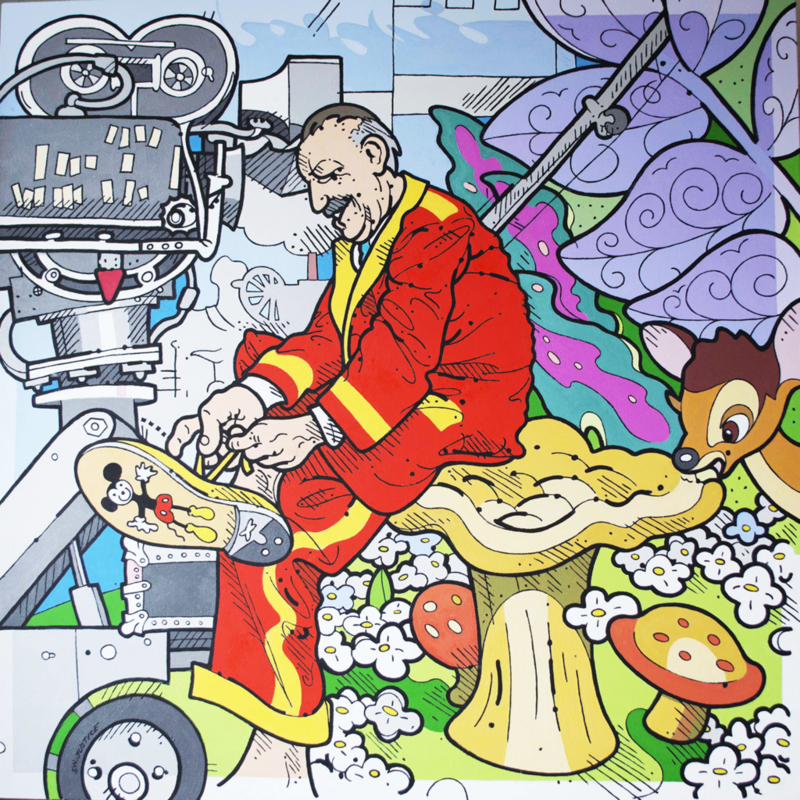 In this animation-cel-like cartoon within a cartoon, Walt Disney may or may not be filming one of his fantasies. I borrowed a few moves from some of Disney’s feature length cartoons in this painting, such as Alice in Wonderland and Bambi, and the red-and-yellow band uniform Mickey wore on the Mickey Mouse Club. But weren’t red and yellow also the colors of communism, which Walt railed against in the 1950s? And wasn’t “Bambi” banned in Nazi Germany? They believed it would weaken children. Eight-balls are no rarer than 5s, 14s or any other balls, I always say. But if I’ve learned anything from Walt Disney over the years, it’s don’t be a troubled genius. It’s not worth the trouble.